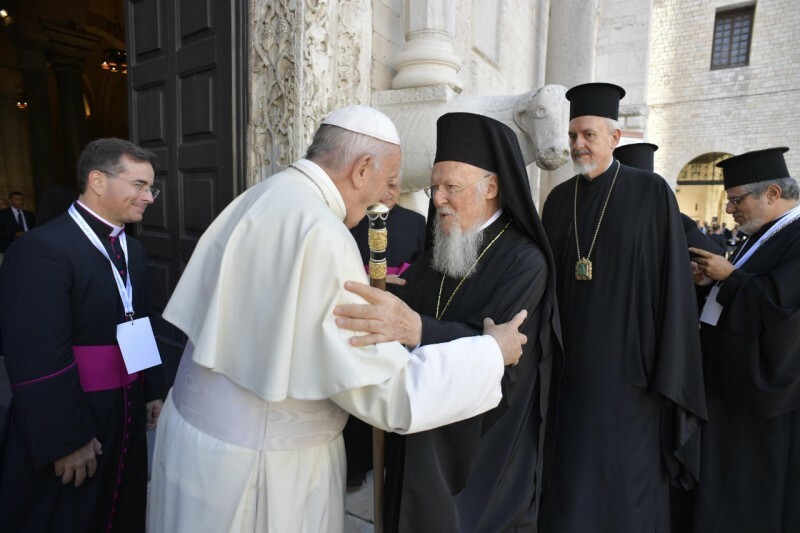 At the end of a closed-door dialogue with leaders of Catholic and Orthodox Christians on Saturday, Pope Francis greets the faithful gathered in the Square outside the Basilica of St Nicholas of Bari, and invites them to pray for peace in the Middle East. The Pope began by recalling the middle-eastern origins of Jesus and Christianity. Instead of using weapons, Jesus asked his disciples to put them away, he said. A renewed conversion to the Gospel is the only means by which to confront the agony that the Middle East lives daily. In imitation of Jesus, our response cannot be “flight or the sword that will lead to the radiant dawn of Easter.” Like Jesus, our response must be the gift of self, the Pope said. Gospel conversion “invites us to find our safety and consolation in [Jesus] alone, and to make him known”, the Pope continued. Rooted in the Middle East, the font of faith provides us with water to drink to be purified with. It is peace that needs to be “cultivated in the parched soil of conflict and discord”. There is no alternative, Pope Francis said. Listening and dialogue, not “truces maintained by walls” lead to peace. Pope Francis said he hopes that “signs of power will yield to the power of signs – as men and women of different beliefs open themselves to dialogue, and the ideas of others. Pope Francis called an end to the exploitation of the Middle East. Let there be an end to the few profiting from the sufferings of many! No more occupying territories and thus tearing people apart! … Let there be an end to using the Middle East for gains that have nothing to do with the Middle East! …Enough of the thirst for profit that surreptitiously exploits oil and gas fields without regard for our common home, with no scruples about the fact that the energy market now dictates the law of coexistence among peoples! Pope Francis concluded his words evoking the sign of the doves that would be released by children. For the sake of the children, “who have spent most of their lives looking at rubble instead of schools, hearing the deafening explosion of bombs rather than the happy din of playgrounds, …may the longing for peace rise higher than any dark cloud”, in the expectation of receiving the olive branch. May the Middle East be an ark of peace, not an ark of war, he prayed. Beloved Middle East, may you see dispelled the darkness of war, power, violence, fanaticism, unfair gains, exploitation, poverty, inequality and lack of respect for rights. ‘May peace be upon you” (Ps 122:8), may justice dwell within your borders, and may God’s blessing come to rest upon you’.